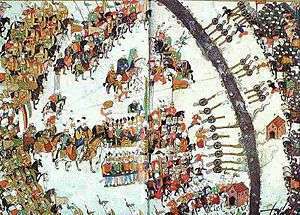 Battle of Keresztes, Ottoman miniature. The Battle of Keresztes (Also known as the Battle of Mezőkeresztes) (Turkish: Haçova Muharebesi) took place on 24–26 October 1596. The battle was fought between a combined Habsburg-Transylvanian force and the Ottoman Empire near the village of Mezőkeresztes (Turkish: Haçova) in northern Hungary. The battle ended with a victory by the Ottoman Empire. On 23 June 1596, an Ottoman Army marched from the city of Constantinople. Commanded by Sultan Mehmed III, the army marched through Edirne, Filibe (now known as Plovdiv), Sofia and Niš to arrive at Belgrade on 9 August. On 20 August, the army crossed the River Sava by bridge and entered the Austrian territory of Siren. A war council was called at Slankamen Castle, and it was decided that they would begin a siege on the Hungarian fort of Eger (Erlau). The fort controlled the communication routes between Habsburg Austria and Transylvania, all of whom were in revolt against the Ottoman suzerainty. However, news soon arrived that the Austrians had besieged and succeeded in taking over the Castle of Hatvan and had killed all the Ottomans housed there, including the women and children. The Ottoman Army started a siege on the fort of Eger on 21 September 1596, and by 12 October the castle had capitulated. As a retaliation to the Hatvan castle massacre, the defenders of this castle were all executed. Not long after, Ottoman command received the report that a mixed army of Austrians and Transylvanians were advancing towards the Ottoman expeditionary force. A war council was conducted under Grand Vizier Damat Ibrahim Pasha. It was decided that the Ottoman Army should march out of the Erlau castle so as to meet the Austrians at a suitable battle terrain. The Sultan thought that the Ottoman army should disengage and return to Constantinople; it was with great difficulty that he was persuaded to engage the enemy forces. The Ottoman army marched through several passageways of marshy terrain and reached Haçova (Turkish meaning: Plain of the Cross), exhausted after a long siege and a hard, long march. The two armies faced each other on the plains of Haçova (Hungarian: Mezőkeresztes). 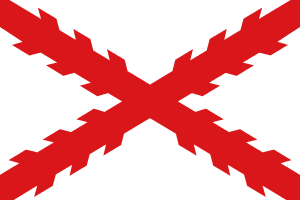 The Austrian-Transylvanian army, under the joint command of Archduke Maximillian III of Austria and prince Sigismund Bathory of Transylvania, was in position in fortified trenches. When the Ottoman army attacked the Austrian trenches, the Battle of Haçova commenced and continued for two days, from 25–26 October 1596. Early firearms (cannons, rifles) were used extensively in the battle. The Austrians, being entrenched around the old ruined church, succeeded in driving back the Ottoman assaults with a barrage of cannon and musket fire. "The Christians broke through the Ottoman army, but the soldiers of the Islam had not yet felt the defeat. Then, they started to plunder and taking of booty at the command headquarters of the Ottomans. Under a few flags, a large group of Christian soldiers attacked the tent where the chests of gold money of the Ottoman Exchequer were kept. They killed and otherwise eliminated the Janissary and household cavalry soldiers guarding the State Treasury. The Christian soldiers got on the Treasury chests of gold coin and put up their flags of cross over them and started to dance around them." Commander Sultan Mehmed III wanted to flee from the battlefield. However, first he asked for the opinion of his tutor, the high cleric Hoca Sadeddin Efendi, Efendi told the Sultan that he should continue the battle till the end. Heeding this advice, Sultan Mehmed III ordered that the battle should continue. On the second day of the battle, the fighting intensified. Troops from the Austrian army had reached the Sultan's tent, which was surrounded by the viziers and the teachers at the Palace Pages School for protection. While some troops were trying to enter the Sultan's tent, the other Austrian army's soldiers disengaged, in search of booty and plunder instead of continuing the engagement. The Ottoman horse groomers, cooks, tent makers, camels minders retaliated against the plunderers with whatever arms they could find, including cooks' spoons, blocks of wood, hammers for tent making, adzes, and axes for cutting wood. The Austrians were surprised and retreated in confusion. The cries of "the Christian enemy is fleeing" were heard by the Ottoman troops still fighting what seemed like a losing battle on the frontline. The boost of morale allowed them to recover the battle. With a major action from the artillery, the Ottoman forces started another attack on the Austrians across the front and outflanked the Austrian-Transylvanian army, routing them. The number of the confronting soldiers has been exaggerated on both sides. The most realistic figures seem to be 50,000 for the Christian and 100,000 for the Muslim army. Soon after victory, Mehmed III appointed Cigalazade Yusuf Sinan Pasha as the new Grand Vizier. He sent an imperial victory proclamation to Constantinople giving the news of the conquering of Egri (Erlau) Castle and the victory at the Battle of Haçova (Keresztes). This reached Constantinople in October and there were public celebrations and public meetings organized in the city. During these celebrations, four galleys full of state procured sugar from Egypt arrived at Constantinople harbor, which added "sweetness" to the news of a military victory. Mehmed III was awarded the epithet of 'Conqueror of Egri'. ↑ Kissling, Hans Joachim, The last great Muslim empires: history of the Muslim world, (Markus Weiner Publishing, 1969), 35. ↑ S.J.Shaw (1976) p.102: In 1541 Ottoman Empire annexed Hungary as the Buda Province and ruled it until 1682 (p.214) when Imre Thököly was recognized as the King of Hungary, Austrian Habsburgs also lay claim to the throne of Hungary. ↑ Ágnes Várkonyi: Age of Reform's, 2004. (Megújulások kora), 27. page. ↑ Kohn, Dictionary of wars, 47. Wikimedia Commons has media related to Battle of Mezőkeresztes.